The company would be upgrading about 5 million CDMA customers to LTE (a 4G standard) technology, riding on Reliance Jio’s 4G infrastructure. Reliance Communications had entered into an agreement for 17 circles airwave-sharing pact in the 800 MHz band with Reliance Jio. It would also sell 800 MHz spectrum to Jio in nine service areas where the latter does not have spectrum in this band. The company will deploy its own 4G network and use Reliance Jio’s infrastructure to deliver 4G services. The first four circles to upgrade will be Haryana, Himachal Pradesh, Uttar Pradesh and Odisha. Rcom CDMA prepaid subscribers have also received SMS asking them to call on 1299 and register for the 4G upgrade by pressing 1. 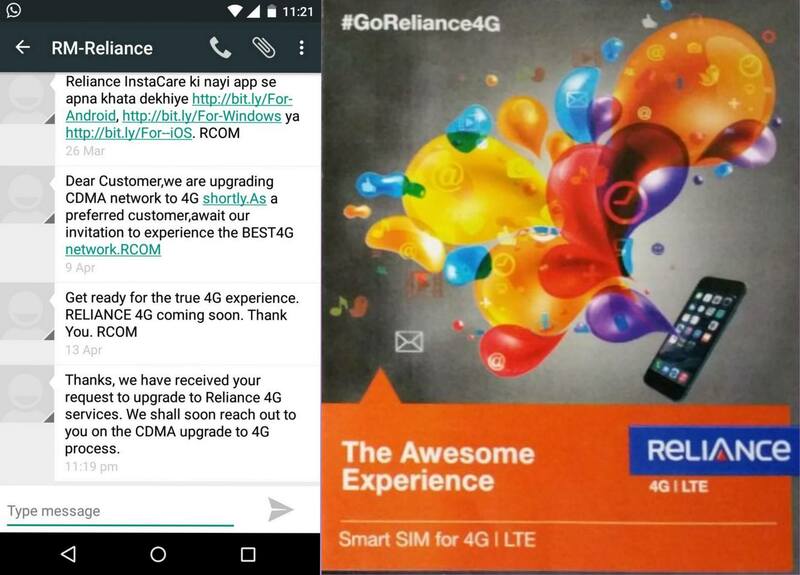 Following this the subscribers are asked to pick a blank 4G sim from the nearest reliance gallery and send an SMS 4G ‘space’ 19 digit number printed on the back of 4G sim and send it to 1299 from the existing CDMA connection and the new service will be activated. This SMS based sim upgrade is similar to the one launched by Airtel at the time of its 4G launch to make the upgrade process smoother. Earlier, Reliance Communications had written to the Department of Telecommunications (DoT) for liberalization of its spectrum in the 800 MHz band and it paid Rs 5,383 crore in January this year to the telecom department to liberalize spectrum in the 800 MHz band across 16 circles. I am trying to convert my idea 4g to jio because it has a best network.